There's nothing like the satisfaction of scratching one more item from your cravings list. My most recent acquisition is the Panasonic Nano Care Facial Steamer. I'm not stranger to facial steamers, in fact, I've owned a handful of them in the past from the most entry level to this deluxe version. Regular steam sessions give me the most amazing skin. Specifically, steaming helps me eliminate the congestion that lies just beneath the surface that gives me the appearance of rough skin if not properly addressed. Paired with my favorite deep cleansing mud mask, regular steaming sessions are a recipe for amazing skin. My strategy was to buy the most expensive steamer I find. I'm hoping this would be that last steamer I ever purchase for the rest of my life so I didn't mind making the investment up front. My other motive was to utilize the steamer as a way of bringing steam setting back into my regimen. My original Caruso Steam Reservoir stopped working eons ago and my facial steamers have served as suitable substitutes ever since. Another major factor that drew me to this particular unit was its cool steam option. I was curious about whether I could actually curl my hair using "cool steam" which could (in theory) help seal the cuticle layer as it curled. Lastly, I made my purchase based on its claim of utilizing nano-particle ion steam. Basically, the particles are extremely small which should equal better penetration and deeper moisturizing to the skin. Immediately, I thought about how my Micromist steamer also uses micro water particles as well. I imagined my skin receiving the same nourishing experience as my hair does on wash days and I was sold. Not to mention how much more moisturized my hair could feel as a result of the steam styling. Less than a week after it's long awaited arrival and I'm ready to share my thoughts. First off, since this is a Japanese product, everything including manual, the writing on the steamer, and the instructional videos on Youtube, are in Japanese. So it took me a few minutes of fumbling around with to figure it out (not sure if I've totally figured it out, there's one button on it that I've yet to understand its purpose). Although the shape of it is a little strange, I like the portability of it and the fact that it has a little handle for carrying. Another thing I really like about it is the water reservoir is removable. This will allow me to clean it if the need arises. Luckily for me, the area where the steam comes out perfectly accommodates my rollers. The rollers rest comfortably on it horizontally and collect the steam as I part my hair in sections. As a facial steamer, this machine is top notch. The steam power is high (meaning lots of steam) and the comfort level is high as well. With some of my other facial steamers, I'd have to be careful not to scold myself if I got too close. This may have something to do with the size of the steam particles. 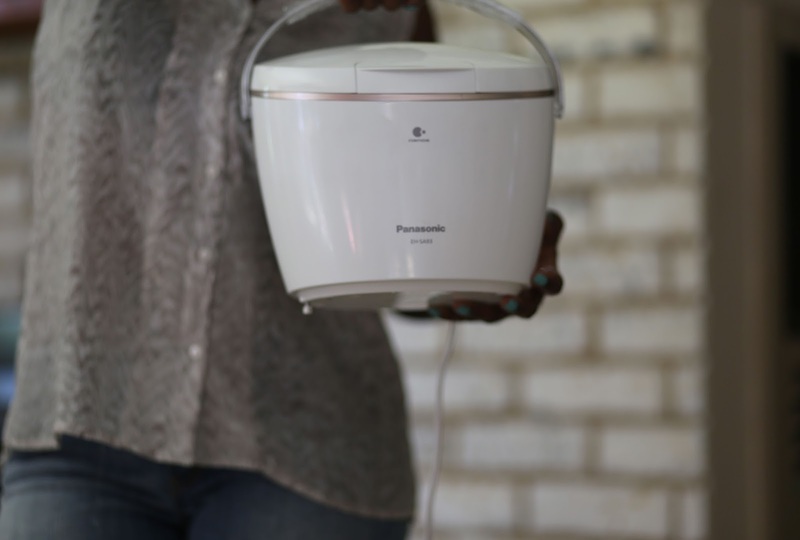 With my Panasonic steamer, I can sit comfortably away from the machine and enjoy a relaxing steam session while working on the computer, doing my nails or whatever. It's such a relaxing experience. The cool steam function is more of a cool mist than a cool steam. My only qualm is that I haven't been able to find how to activate the cool mist on it's own. Based on what I know so far, it's added on to the end of a traditional warm steam session. To date, I've used this beauty less than a handful of times. I can not begin to tell you the difference between my skin now and how it looked before my steamer arrived. This thing is worth it's weight in gold for just that reason alone. My favorite thing to do is steam in the morning while practicing the Tanaka Massage technique. Overall, I judge how good an item is by whether I would repurchase if it were to break or if I were to lose it. If this were to break, I would replace without even thinking about it. Sure, it's pretty pricey but it pays for itself when I think about how much I save from not having to get professional facials. Plus, I can't see myself going back to the other steamers I used before that gave just ok results. This is definitely one of my favorite purchases this year. I purchased on Amazon but the supplier took too long to ship so I cancelled my order and grabbed one off of Ebay instead.